How to hyper target your audience for easy and powerful profit. Learn Why This Super Affiliate Is Â“Pulling Back The CurtainÂ” On His Snapchat Ad Buying Secrets And Showing You Exactly How To Market Effectively on Snapchat! Long story short I found a Â“goldmineÂ” and finally was able to consistently provide for my family. Limited CompetitionÂ… For Now! Â“So why would you tell me about this, Matt?Â” Because thereÂ’s pleeeeeeenty of room for growth (but it wonÂ’t last long). Super simple platform thatÂ’s easy to navigate. You donÂ’t need to be a data scientist to successfully run ads on Snapchat. You donÂ’t need a creative team to put together ads. If you have 50 bucks, photoshop, and a fun brain, then youÂ’ll do very very well on Snapchat. Snapchat is the perfect Â“low barrier entry modelÂ” that makes it easier to run than Facebook. You donÂ’t need a 3rd party tracker. Never experience the frustration of ad platforms that donÂ’t care about you. 11 step-by-step training chapters (totals over 4 hours of Â“hold your handÂ” content) on how to create, run, and profitably scale ads on Snapchat. Why Snapchat is the best platform right now for online marketers, especially if youÂ’re looking for a platform with more vertical opportunities. How to get creative uploaded and approved quicklyÂ… and once your creatives are approved, it becomes even easier! How to make one Â“fire creative templateÂ” to be used over and over again with consistent, powerful results (this alone has helped generated thousands upon thousands of dollars for my clients). How to negotiate an affiliate marketing deal that is so stupid lucrativeÂ… itÂ’ll make you want you to Â“jump shipÂ” on all other platforms. What niches work like gangbusters on Snapchat (basically there are massive groups LOOKING for the kinds of ads IÂ’m makingÂ… and thereÂ’s a lot of money to go around). 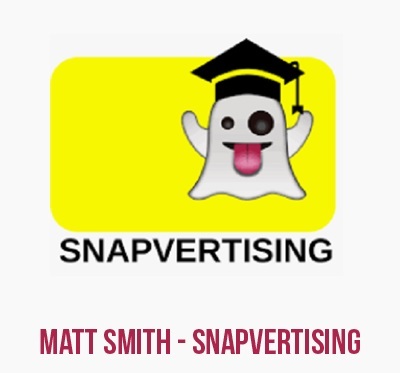 The easy-to-follow 4 keys to producing a winning Snapchat ad every single time, even if youÂ’ve never touched Snapchat your entire life. How to lower your ad costs on Snapchat with a simple technique that is easy to do even if Â“budgetingÂ” and tech annoy you (IÂ’ll show you each step of the way and show you how simple it is). How to Â“funnel hackÂ” Snapchat ads and how to find winning funnelsÂ… while also avoiding the Â“funnel dudsÂ” that Â“lookÂ” like winners but could ruin your campaigns if you follow their steps. What to do between day 1 and day 7Â… including targeting, new snap campaigns, and unleashing your lookalike audiences. The 3 Â“need to knowÂ” rules for buying media on Snapchat that most new marketers to Snapchat disregardÂ… and how it destroys their ad accounts in a heartbeat. How to discover your Â“campaign objectiveÂ” that can ensure you achieve your budgeting and bidding goals every single time. 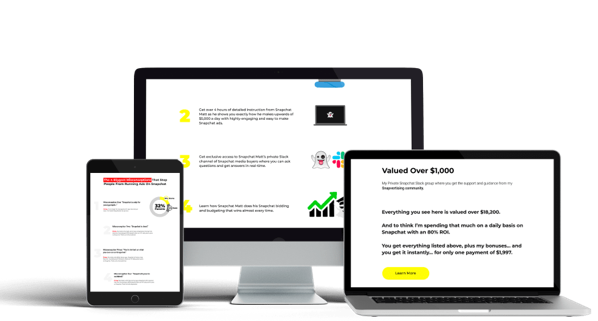 My personal 3 bidding methods that are easy to implement and so powerfulÂ… this is how IÂ’m able to spend 20K a day with an 80% ROI. These methods include: The Sweet Spot, Low Hanging Fruit, and Shock and Reset. How to stay compliant on SnapchatÂ… and forever remain in their good graces for ad campaign longevity. Last edited by madiony; 03-20-2019 at 12:41 AM.